Remove any rough, crescent-shaped muscle from outsideof scallops and discard. Pat dry scallops. Season one side with salt and pepper. Set aside. In a small bowl, combine flour, apple cider vinegar, and maple syrup. Set aside. Heat a cast iron pan over medium heat. Add bacon to pan and cook until crisp. Remove with a slotted spoon and place on a paper towel-lined plate. 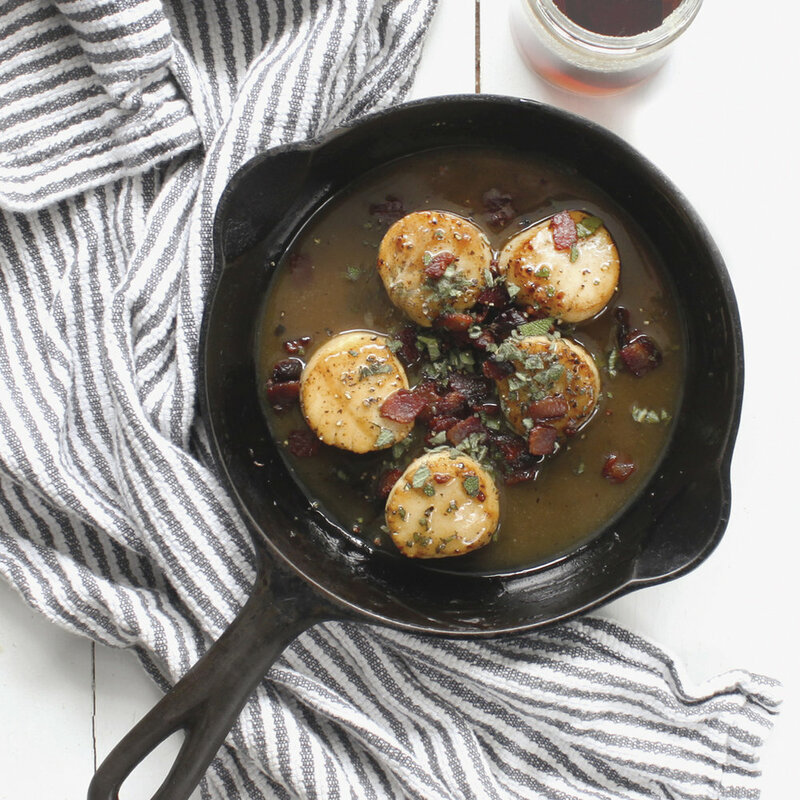 Add scallops to pan, seasoned-side down, and cook until lightly browned, about 2 minutes. Baste scallops with bacon fat as they cook. Turn scallops and cook for another 30 seconds to 1 minute. Add chicken stock to pan to deglaze, scraping up any browned bits on bottom of pan. Cook for another 1 minute. Add maple syrup mixture and cook until sauce starts to lightly bubble. Remove pan from heat andadd butter and sage. Stir in bacon and serve warm.